Product prices and availability are accurate as of 2019-04-20 17:55:38 UTC and are subject to change. Any price and availability information displayed on http://www.amazon.com/ at the time of purchase will apply to the purchase of this product. 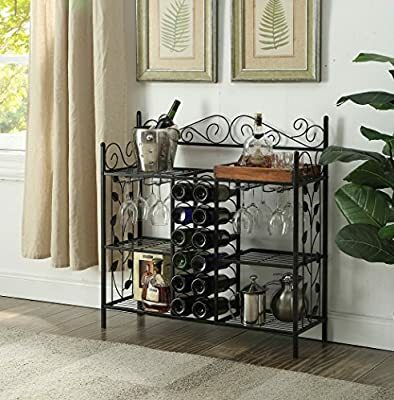 This Black Metal Six (6) Shelf Kitchen Bakers Rack Console Table with 12 Bottles Wine Storage and 12 Glass Holder is a great addition to your home decor. Features 6 Metal Shelves and Metal Shelves with 12 Wine Bottle Rack and 12 Glass Holders. Measures: 36.5 inches high x 35.5 inches wide x 12 inches deep. Assembly required.